Summer is almost here! So whip out those water wings, floaties, and pool noodles it is time for swimming! We all love to get a little wet in the cool water during those hot summer months. But we all know how quickly our boys outgrow their swimsuits every year. So of course we will need to outfit them with all new gear before they can hit the pool again is summer. Lucky for you The Boy’s Store has some great options for swimwear this year. Some of coolest brands we have, Appaman, Dogwood, Wes and Willy, and Flap Happy have trunks and rash guards on sale now. So check out our boy’s swimwear selection before we run out. Rash Guard by Appaman: do you worry about your boys getting too much sun exposure during those long summer days by the pool or at the beach? Appaman has you covered, literally, with their hip rash guards. These shirts not only provide sun protection they are also a good way to add extra warmth I that too cold ocean. They also protect your boys while surfing, body surfing, or boogie boarding. Available in 2T-10. Orange Crab Board Shorts by Dogwood: Orange is a great color for summer. Just like the hot sun it is a bright and brilliant color that reminds us how fun and active our summer time really is. These board shorts are perfect for hot weather, cool water, and very active boys. They feature a crab and surfboard screen print that will fit in perfectly with the summer surroundings. Available in 2T-Medium. 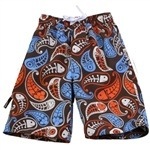 Paisley Fishbones Swim Trunks by Wes and Willy: Available in size 4-12 these are perfect for our hipster boys. The colorful Fishbones on a cool brown background are totally hip and cool. They feature a working drawstring for those growing boys between sizes that need the extra cinch, or for those that just like to tie on their trunks. No matter what your style these trunks will be a hit! Monster Fish Rash Guard by Flap Happy: Another great rash guard, this one is a Flap Happy design and is brightly colored in hues of blue and orange. Available in 2T-7 your boys will love the look, while you will be thrilled with the extra protection. Just remember the cooler the shirt the more likely your boys are to wear it. That’s why Flap Happy makes such fun and bold color and print choices. No boy will turn down this fun piece. This entry was posted in boys clothing, Featured item and tagged Appaman, board shorts, Dogwood, Flap Happy, rash guards, summer clothes, swim trunks, Swimwear, the boys store, Wes and Willy on May 19, 2013 by Lacy.